There’s no way around it, Moscow is pricey, and its nightlife scene is no exception – if you’re intent on painting the town red (you are just steps from the Red Square after all! ), you might as well get something more than a cheap vodka buzz for the cost of your drink. While you might not be able to dole out the big bucks for the pricey digs at these two swank Moscow hotels, there’s nothing keeping you from sampling their crowning glories. 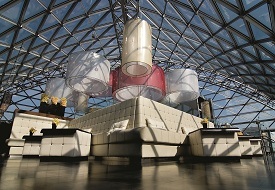 Each boasts a rooftop bar with prime panoramic perches, where, for the cost of a splurge-worthy cocktail, more budget-friendly brew, or simply a stiff drink, you can rub elbows with a motley mix of moneyed Muscovites (business tycoons, Kremlin bigwigs, celebs and pseudo-celebs – which, while I was there, came in the form of members of the Russian national soccer team), and lap up mesmerizing Moscow views that are even more intoxicating than your drink. High above the distinctive glass-and-steel tower that houses the city’s top-rated Swissôtel Krasnye Holmy hotel, the stylish, 34th-floor City Space Bar mixes sweeping 360-degree city views (courtesy of wraparound floor-to-ceiling windows) and masterfully crafted cocktails. Helmed by renowned mixologist Bek Narzi (who brings world-class bartender skills from his past gigs at top London watering holes), the menu spans a variety of unique cocktails (classic, molecular, mocktails). Try the Moscow Spring Punch, a lip-smacking blend of vodka, fresh raspberries, honey, homemade ginger ale, and lime. Each month, the bar also hosts special appearances by celebrity guest bartenders from around the globe (like NYC mixologist Brian Miller, headlining this month), and DJs spinning nightly (except Sundays). Opens 5pm daily; no cost for entry or minimums required for table reservations; beer and spirits from $10, cocktails from $23. Set just a stone’s throw from the Kremlin, the lavish Ritz-Carlton Moscow’s 12th-floor rooftop O2 Lounge boasts breathtaking views over the Red Square, Kremlin towers, and the city's signature onion-shaped cathedral domes. Capped by a glass-and-steel dome, which lets the light in (and keeps the cold out during chillier weather), the space-age, design-savvy space is accented by dangling Fabergé egg-inspired chairs, mod white leather chairs, and Bohemian crystal hookah pipes; during warmer months, the spacious outdoor terrace beckons with a grill and dance floor, too. The colorful cocktail list sources natural ingredients (i.e., freshly squeezed juices, berries, etc.). Try the Red Square, a blend of vodka, rosemary, raspberry, lime juice, and vanilla syrup. If you’re prepared to splurge, pair your drink with selections from one of Moscow’s top sushi joints (fish are flown in from the Tsukiji Fish Market in Tokyo). An extensive champagne list might be worth reviewing for the free show: buy any bottle of champagne (starting from a whopping $259), and be treated to a complimentary “sabrage,” a ceremonial sword-opening spectacle. The hotel can also arrange a private vodka tasting led by the in-house “vodka sommelier” to help guide you through a small sampling of Russia's favorite liquid pastime ($113 per person). Open daily from noon; no cost for entry or minimums required for table reservations; beer and spirits from $11; cocktails from $27.